Machine Data Transducers (MDT) are operator/machine interfaces that collect, display and transmit real-time data to a remote Windows-based PC. MDTs connect directly to ANY production machine using existing electrical signals that operate the machine: switches/relays, photo/proximity sensors and voltages from 24V-120V AC or DC. 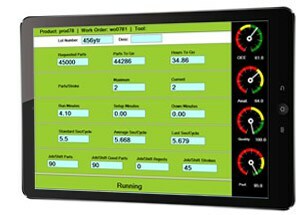 All MDT models can operate in the same system, enabling you to match system features to each machine for the most flexible and cost-effective system available today. 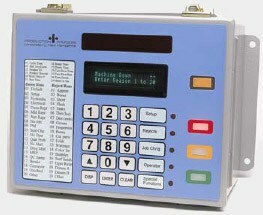 Required for an OEE calculation, ALL MDT have ability to track Rejects, both automatically and through Operator input. MDT-20 provides four machine connections for collecting production, productivity and OEE data, run time, down time, cycle time, production rate, part and reject counts, end-of-line Case or Part count (use for indirect count of rejects). Uses wired or wireless Ethernet plant-floor communications. Selecting next Job in Job Queue on PC or with Bar Code wand. Entering Non-Scheduled Mode–important for OEE. Entering Setup Mode—MDT can automatically track Rejects in Setup. Log on Operator and Maintenance stafffor performance tracking. Machine Lockout output ensures Operator enters down reason. 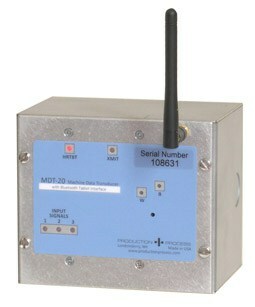 Plant-floor communications: MDT-20 to Tablet is Blue Tooth, Tablet to system Poller PC is Ethernet (wired or wireless). Typical Operator data entry/display Functions as in Tablet (above). Operator enters 40 downtime reasons, 20 reject reasons and quantity. Six machine connections for production, productivity/OEE recording and real-time display, automatic tracking of rejects, machine down sensing, end-of-line part/case counting. 4 outputs for machine “lockout” to ensure down reason entry, and to drive three-color light tree. Optional bar code job change. Plant floor communications: wired or Ethernet (wired or wireless). Newer “intelligent” (communicating) PLCs and machine controllers can communicate production data and performance metrics via OPC. ProductionACE supports the OPC Standard and other methods to provide the most flexibility in integrating ALL the equipment on your production floor.